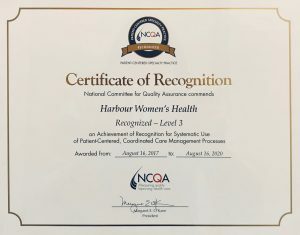 Harbour Women’s Health is honored to announce it has received three-year recognition by the National Committee of Quality Assurance (NCQA) for Patient-Centered Specialty Practice. NCQA is a private, nonprofit organization dedicated to improving health care quality. NCQA accredits and certifies a wide range of health care organizations and manages the evolution of HEDIS®, the performance measurement tool used by more than 90 percent of the nation’s health plans.